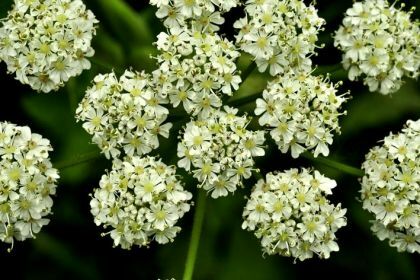 Probably the most commonly seen member of the Apiaceae family, Hogweed is a tall (sometimes over 2 m) stout, biennial or perennial plant which grows in meadows, in hedgerows and other grassy places. 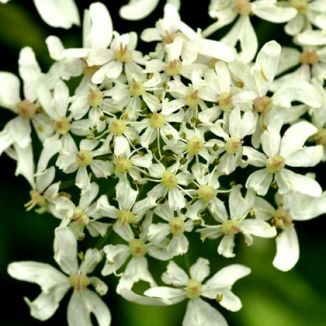 As its family name suggests, it bears its flowers in large, wide umbels, up to 20cm across. Blooming from June to September, each white or pink flower has uneven, notched petals. The hairy leaves are pinnately lobed with an inflated leaf base, the leaflets are toothed and downy below. This is a native plant. My first record of this plant is in 1977 in Dalkey, Co Dublin. I photographed it in Wellingtonbridge, Co Wexford in 2006. The name 'Hogweed' was given to this wildflower because it was used as a source of food for pigs.